Easily breaks down for transport with the heaviest piece weighing only 33.5 lbs.! The Go-Go Elite comes standard with 2, 12ah batteries. Optional 17ah batteries are available for those who desire more power. 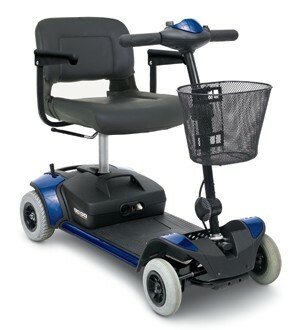 Introducing The NEW Pride Go-Go Elite Traveler 4 wheel transportable scooter. The new Go-Go Elite offers the same great features of the original Go-Go with many added features. The Go-Go Elite will easily disassemble into 5 easy to transport pieces, with the heaviest piece weighing only 33.5 lbs. 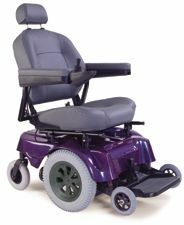 The added features include a new swivel seat with armrests and added padding for more comfort, front basket is standard, solid tires, auto connecting mechanism permits simple frame separation with one hand with no cable to plug or unplug. The new color change kit allows you to change the scooter color from red, blue or silver. The convenient off-board charger allows you to charge the batteries on-board or off-board. The New Go-Go Elite is now a Medicare billable item. Auto- latching lockup mechanism permits simple frame separation with only one hand. Auto connecting front to rear cable. Includes 3 sets of easily changeable colored panels in 3 exciting colors (red, blue, silver). Up-graded swivel seat with added padding armrests and flip down seat back. Front basket standard. Upgraded 260 lb. weight capacity. Total Weight w/o Batteries 79 lbs. Easy to remove auto-connecting battery pack with off board charger. Charge the batteries while connected to the scooter, or apart from the scooter. 5 Easy to disassemble pieces for easy transport and storage! Weight of heaviest piece only 33.5 lbs. Front section - 33.5 lbs. Rear section - 22 lbs.